Almost 400 million people live with diabetes worldwide, and it is estimated that the number will double by 2030. A big part of the daily management of the disease is self-monitoring of blood glucose. The monitoring help identify high or low blood glucose levels, the effects of medications, understand how diet and exercise affect it, and judge the overall treatment goals. The frequency of testing depends on the type of diabetes or the treatment plan. However, pricking your finger for a drop of blood multiple times a day is not only painful, but time consuming, can cause calluses and sensitive fingers, and is difficult if you have visual or dexterity limitations. As a result, many can develop negative perceptions about blood glucose monitoring, leading to avoidance. 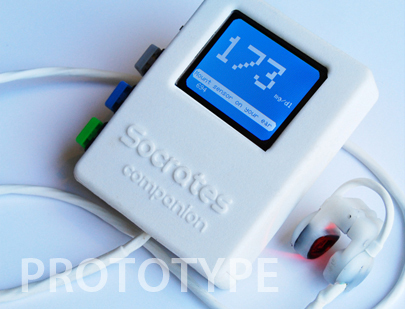 SocratesHealth Solutions, a Dallas, US based startup, has developed Socrates Companion. The device provides a convenient, accurate and pain-free glucose reading, which does not require the collection of blood. Companion has a sensor that clips to the ear, and pass light from one side of the top of the ear to the other. The small and inexpensive device accurately and painlessly measure glucose levels in seconds and as often as desired by the user. While the device is still in the research and development phase, the company is also working on another model that connects with the user's smartphone. According to the company, this version will be similarly priced to the fitness monitors that are currently on the market. Socrates Health Solutions has developed an innovative product with the potential of changing millions of lives, and transform the glucose testing market that is currently estimated at over $10 billion dollars a year worldwide.